Advocates recently gathered in support of alternatives to youth incarceration. Virginia continues to struggle with issues relating to juvenile justice and student discipline. In 2015, more youth in Virginia were referred to law enforcement than all other states across the country. While that’s not the case now, the state continues to outpace many others when it comes to the number of youth who are arrested – and end up behind bars. “At night I know I’m locked in. I’ll be up at like 3 in the morning just looking at the door. The cold door open up, but it ain’t opening for me.” That’s the voice of a teen who was incarcerated in a detention center. 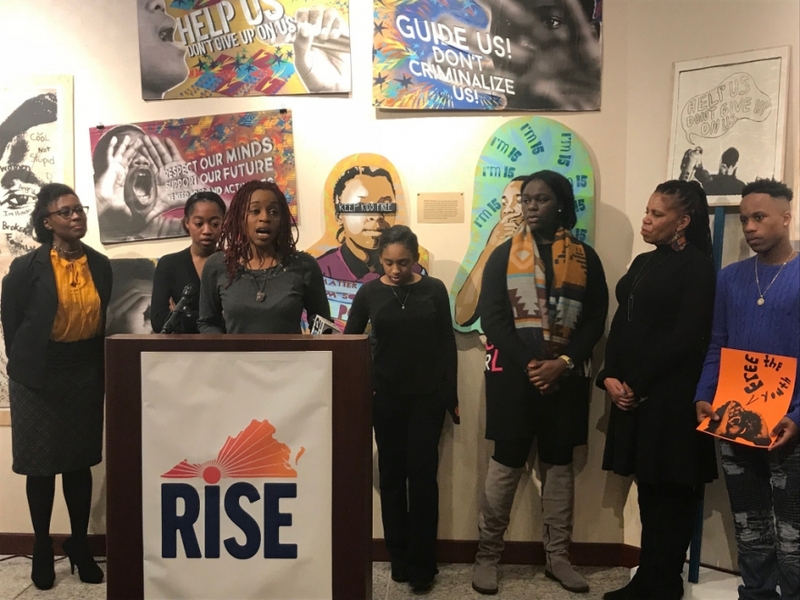 As part of the Performing Statistics art and advocacy initiative, he and other youth detained at the Richmond Juvenile Detention Center recorded their experiences and observations. Beaumont closed last year due to a number of factors. In 2016, Virginia’s Department of Juvenile Justice announced plans to transform its current system and turn youth prisons into rehabilitation centers. Director Andrew Block shared some of his vision in a Ted talk last year. Block aims to decrease the number of total youth beds by 70% from 550 in 2016 - which included those at Beaumont - to about 150, but he says it’s not realistic to think secure facilities can go away any time soon for all youth. The department has requested help from the state to build a 60-bed youth facility near Hampton and a new facility to replace Bon Air. Valerie Slater with the Legal Aid Justice Center says this doesn’t do enough for the Hampton Roads community – where there’s a high percentage of incarcerated kids. While she agrees with Block that sometimes a secure setting is necessary, she says the proposed location for the 60-bed center – on the Isle of Wight - is too isolated. She adds it should be even smaller – around 30 beds or less - and situated in the community itself. Slater and others would like to see the department partner with programs that are already working in the community - like Teens with a Purpose - as well as those that’ve been effective in other states, like the Roca program in Boston - that intervenes in the lives of at-risk young men, moms and gang members to help them find employment. Meanwhile, Slater and others say the state needs to do more to prevent young people from ending up in jail in the first place. Several bills are in play to address what’s known as the school-to-prison pipeline. There’s been a compromise on a Senate bill originally prohibiting suspensions and expulsions for most kids grades K-3 to allow three-day suspensions. Republican Delegate Dickie Bell –who is sponsoring a similar House bill - says that suspension length is already common. Stacey Doss’s five-year-old son is African American and has a learning disability. She says because of her son’s problems in the classroom, he’s been suspended several times much to her – and her son’s - dismay. Bell says it doesn’t benefit the student to send a kid that age home. Both bills will come up in full committee next week. Democratic Senator Jennifer McClellan has also introduced a budget amendment to remove a recession-era cap on school support staff who could help those like Doss’s son. Additionally - Democratic Delegate Jeff Bourne has a bill aiming to cap the length of long-term suspensions at 45 days – instead of the currently allowed 364 days. Bourne’s bill is expected to come up for a vote on the House floor today (2/6).